"If it's not safe for me, then it's not safe for any of my people." Open Road Films has released another new official trailer for the historical romantic drama The Promise, set during the last days of the Ottoman Empire. The film follows a love triangle in Turkey/Armenia between Michael, a brilliant medical student, the beautiful and sophisticated Ana, and Chris - a renowned American journalist based in Paris. 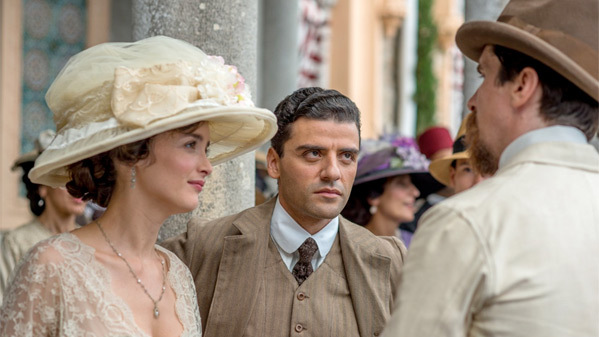 Starring Oscar Isaac as Michael, Christian Bale as Chris, and Charlotte Le Bon as Ana. Also featuring Angela Sarafyan, Shohreh Aghdashloo, James Cromwell, Jean Reno, Rade Serbedzija, and Michael Stahl-David. I'm no more interested in this than I was with the first trailer. It seems like an odd attempt to tell the Armenian genocide story with a Hollywood cast. But it's hard to pass up a movie with Isaac and Bale. It is 1914. As the Great War looms, the vast Ottoman Empire is crumbling. Constantinople (Istanbul), its once vibrant, multicultural capital is about to be consumed by chaos. Michael Boghosian (Oscar Isaac), arrives in the cosmopolitan hub as a medical student determined to bring modern medicine back to Siroun, his ancestral village in Southern Turkey where Turkish Muslims and Armenian Christians have lived side by side for centuries. Photo-journalist Chris Myers (Christian Bale), has come here only partly to cover geo-politics. He is mesmerized by his love for Ana (Charlotte le Bon), an Armenian artist he has accompanied from Paris after the sudden death of her father. The Promise is directed by Terry George (of Hotel Rwanda, Reservation Road, The Shore), from a screenplay by Terry George and Robin Swicord. It first premiered at the Toronto Film Festival last year. The Promise opens in theaters starting on April 21st.